It's 1931 and having dealt with Al Capone's diamond smuggling operation in the Belgian Congo Tintin and Snowy head for Chicago to clean up Gangsterland. He almost at once runs afoul of Al Capone himself but manages to evade the mob boss only to find himself making an enemy of Capone's rival Bobby Smiles. Smiles repeatedly tries to have Tintin killed but after the young reporter turns the tables on him Smiles flees Chicago for Redskin City and Tintin spends most of the rest of the adventure trying to bring him to justice. He returns to Chicago in time for a showdown with the rest of the mobsters. 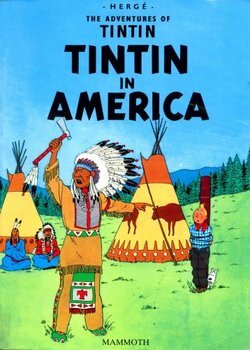 For many years Tintin in America was the earliest adventure available in English and it shows. Aside from Tintin and Snowy there are no other familiar characters, the plot (and research) is near nonexistant, and Snowy still talks (admittedly only on one page). Animal Wrongs Group: An elderly woman on a train pulls the lever because she saw a puma attack a deer and insists the conductor intervene. She ends up inadvertently saving Tintin's live since he was Chained to a Railway at the time. Bad Cop, Incompetent Cop: Some of them actually make the Thompsons look halfway competant. Cowboy Episode: It was based on European stereotypes of the USA and features plenty of Wild West imagery despite being set in the 1930s. Deus Ex Machina: Arguably uses this more than any other entry in the series. Smiles' mooks using knockout gas instead of poison gas by mistake, the animal lover stopping the train, Tintin and Snowy being tossed off a cliff and landing on a branch conveniently next to a cave network, the cannery workers going on strike, Tintin mistakenly being tied to a set of wooden weights rather than real ones. Early Installment Weirdness: Tons of it! Basically, the USA gets Flanderized to the point that it reads like an ...actually pretty amusing parody overall. Injun Country: A rather mixed example - the Blackfeet Indians are violent and gulible but they are also depicted as victims. The Man They Couldn't Hang: Tintin. Twice. Mystery Meat: Grynde Corp. make their tinned meat out of dogs, cats, rats and nearly Tintin, until he escaped. Random Events Plot: Not to the same extent as Tintin in the Congo but definitely compared to the later books. Wretched Hive: Chicago is presented as such, and the US as a whole comes across as a Crapsack World. This page was last edited on 9 April 2014, at 06:11.